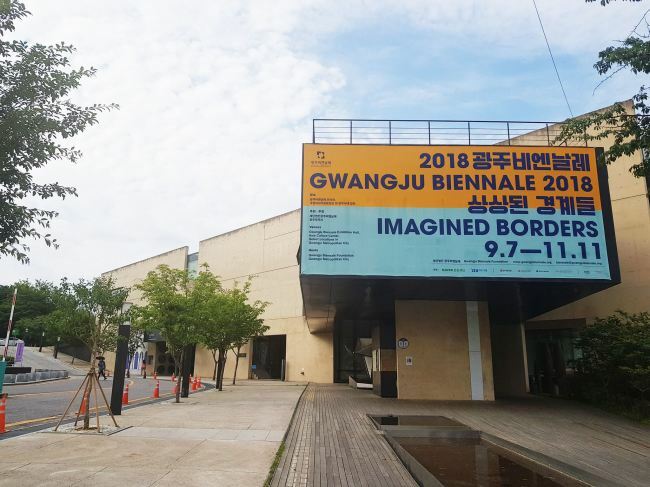 Slated to kick off on Sept. 7, 2018 Gwangju Biennale expects to complete all preparations by Sept. 4, according to the biennale foundation officials Monday. A total of 164 artists from 43 countries will have their works exhibited at venues across the whole city in the largest art festival in the country. The main project, “Imagined Borders,” comprises seven separate exhibitions curated by a collective of 11 curators. The curators include Clara Kim, a senior curator at London’s Tate Modern; Gridthiya Gaweewong, artistic director of the Jim Thompson Art Center in Bangkok; Rita Gonzalez and Christine Y. Kim from the Los Angeles County Museum of Art; and B.G. Muhn, a professor at Georgetown University. The seven exhibitions by the curators collective will held at the Gwangju Biennale Exhibition Hall and the Asia Culture Center. Clara Kim’s exhibition at Gwangju Biennale Exhibition Hall will offer a perspective into the dynamics between modern architecture of the mid-20th century and the historical and political background of state-driven city planning and national reconstruction processes. Muhn has organized an exhibition featuring North Korean artists that will be held at the Asia Culture Center. “GB Commission” is dedicated to exploring the origin of the biennale and the history of the city, particularly marked by the Gwangju Democracy Movement. Four artists -- Adrian Villar Rojas, Mike Nelson, Kader Attia and Apichatpong Weerasethakul -- have been commissioned to create site-specific installations throughout Gwangju. Mike Nelson’s works that attempt to shed new light on the democratization movement in Gwangju will be installed at the former Armed Forces’ Gwangju Hospital, now an abandoned site, where citizens wounded in the military crackdown received medical care. Works by Weerasethakul will also be presented at the same venue. “Pavilion Project” will be shown at the Gwangju Civic Center, Mugaksa Temple and other local venues across the city. 2018 Gwangju Biennnale will run Sept. 7 to Nov. 11.